Samaos, aka Caramel Delights, aka the greatest Girl Scout Cookie of all time (some might say), can be kryptonite for many people who have a sweet tooth. 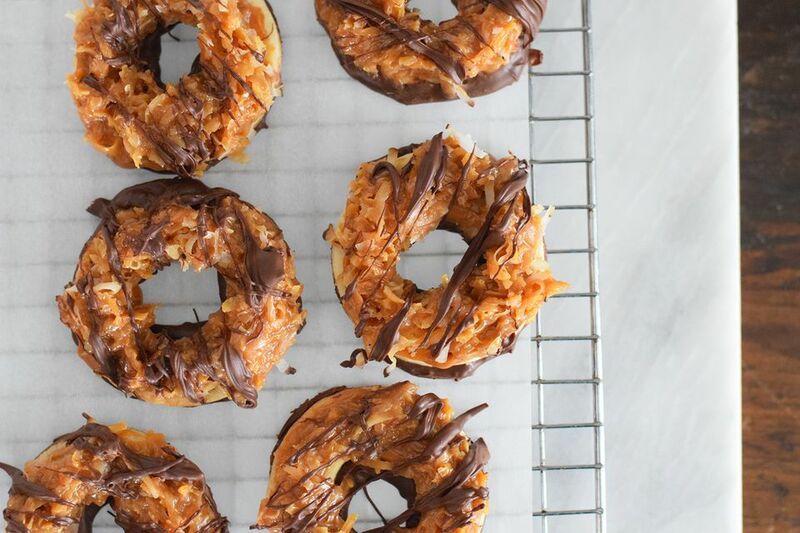 The base is made from homemade shortbread cookie, the topping is coconut and caramel, and then the entire thing is dipped and drizzled in chocolate. And, although the boxed kind is delicious, the homemade kind can be much more rewarding (for both tastebuds and wallet, alike). Do note: these cookies do involve a few steps, but the fact that you won't have to wait until next year's sales to grab a box, put these high on the list of must-have cookie recipes that you can make all year long. Bonus: You can easily freeze these cookies once they are completed and serve them when it's convenient, for example when you have a last minute guest. Recipe modified from Creme de La Crumb. In the bowl of a stand mixer or in a medium-sized bowl with a hand mixer, beat the butter and sugar until creamed. Then add the vanilla and beat again. In a separate bowl, stir the flour, baking powder, and salt together. Then gradually add it to the butter mixture, being careful not to over mix. Scrape down the sides of the bowl and add the milk. Mix until combined, do not over mix. Form the dough into a ball and wrap it in plastic wrap. Place the dough in the refrigerator for at least one hour, or up to 2 days. Once the dough has chilled, roll it into a 1/4-inch thick sheet. Use a doughnut cutter to cut the circles out of the dough. If you don't have a doughnut cutter, use one larger biscuit cutter and then a much smaller one to cut out the center. Place the cookies on a parchment lined baking sheet. Roll the scraps back into a ball and roll it out into another sheet. Cut out more cookies and place them on another baking sheet. Bake for 10 to 12 minutes or until just set. The edges may be very lightly browned but the cookies themselves should not look brown. Allow them to cool on a cooling rack. While they are cooling prepare the caramel topping. Lower the oven to 325 F. Place the coconut flakes on a baking sheet and place it in the oven for 5 to 10 minutes. Stir about halfway in between to ensure even browning. Remove the toasted coconut from the oven and allow to cool slightly in the pan. Add the caramels and the heavy cream to a medium-sized microwave bowl. Microwave for about 2 minutes, then remove and stir. Microwave for 30 second intervals, stirring in between until the caramels are completely melted. Add the vanilla and salt. Spread 1 to 2 teaspoons of the caramel onto each cookie. Stir the coconut into the remaining melted caramel until completely combined. Add about a tablespoon of the coconut mixture onto the top of each cookie. Spread and mold the caramel so that it sits evenly on top of the cookie. Place each cookie on top of a fresh sheet of parchment paper. Melt the chocolate chips in the microwave or in a double boiler, stirring in thirty second intervals until the chocolate has melted completely. Dip the bottom of each cookie into the melted chocolate and place on the fresh sheet of parchment paper. Drizzle the top of each cookie with the remaining melted chocolate. Allow to cool completely (at least 1 hour) and serve!